This is a premium supported training tour. We will stay in hotels and have a support vehicle to carry luggage. This will free us up to travel light and enjoy the scenery and the ride! Breakfast and lunch included each day. Opening dinner, Pizza Party, and Celebration Dinner included. This is a physically challenging training ride that requires at least an intermediate skill level. Big ADV bikes are appropriate for riders with a high degree of skill and fitness. Smaller dual sport bikes are safer and more fun for less skilled riders. All bikes must be street legal with a fuel range of at least 100 miles per tank. Safety is paramount. Alternate easier routes are offered on the two most challenging days. The lead guide has the right not to allow riders to continue on demanding routes. Any rider who does not demonstrate foundational skills and control on Monday’s ride must rider alternate routes. All riders will receive training from instructors each day. The ride is limited to 8 riders. There will be one Instructor Guide for every four students. REGISTRATION IS NOT OPEN UNTIL WE FINALIZE OUR 2019 SCHEDULE. MONDAY Section 5 BDR: Tour will travel via pavement from Granby to Steamboat Springs. After fueling up we jump onto the official COBDR! We’ll ride mellow dirt on Lynx Pass before our first water crossing of the tour. Winding through Aspens on hard packed dirt, down steep hills and switchbacks into Radium. From Radium riding is fun, easy, following the Colorado River along Trough Road and the Colorado River Road into Gypsum. FOUNDATIONAL SKILLS will be taught in this section. Riders who wish to ride the challenging main COBDR route must successfully demonstrate skills riding water crossings, steep downhills & uphills, and tight switchbacks. 60% dirt 40% pavement. TUESDAY Section 4 BDR: We will offer two routes. 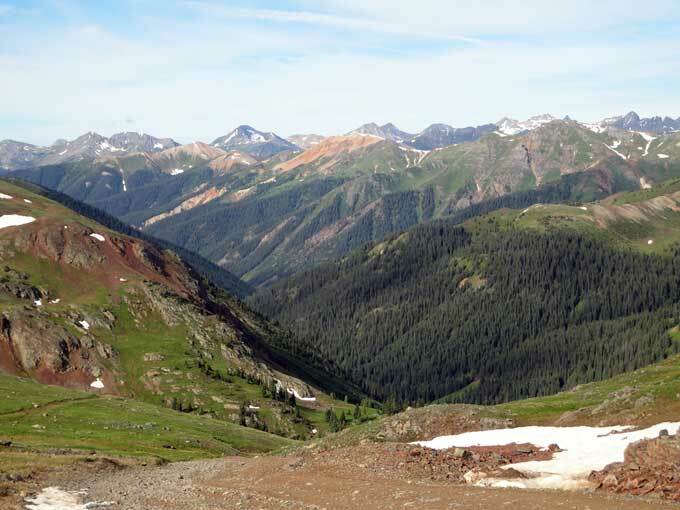 The main COBDR route travels through picturesque Aspen forests, over stunning Hagerman Pass, and into Buena Vista. This is a challenging day that includes riding ruts, water crossings, rocks, difficult jeep tracks, and elevation. 90% dirt 10% pavement. 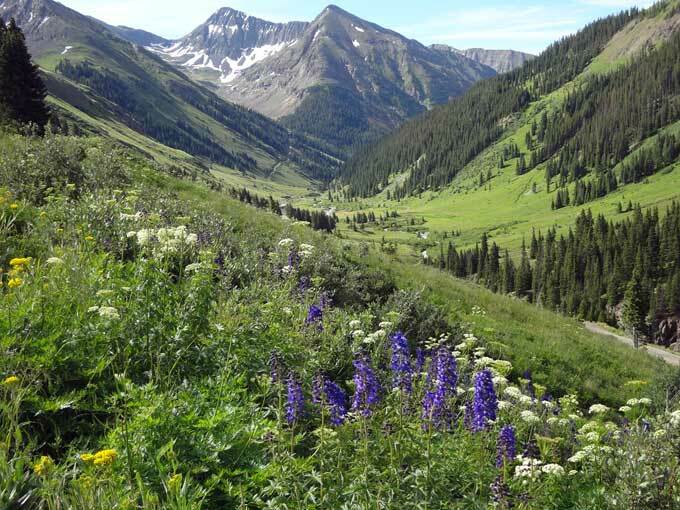 Our alternate route meanders back roads and byways through Colorado ranch land, dramatic high mountain vistas, along scenic Colorado waterways, and over Independence Pass. 30% dirt 70% pavement. Both routes will travel through the famed railway tunnels into Buena Vista. Riders will enjoy a delicious Pizza Party and a soak in the Cottonwood Hot Springs. WEDNESDAY Section 4 BDR: Riders have the option of taking a day off or doing a half day ride over Weston Pass and through 4 Mile OHV. The OHV section includes several large water crossings, sand sections, and tight ATV double track. 90% dirt 10% pavement. We will all have the afternoon for shopping, massages, and a soak in the Cottonwood Hot Springs in the afternoon and evening. THURSDAY Section 3 BDR: A 2018 paving project will shut down a portion of the BDR route over Cottonwood Pass into Taylor Park (Note there are three different Cottonwood Passes in Colorado!) Never fear – the official alternate route is beautiful and fun. All riders begin traveling dirt through rolling hills, aspen groves, and spectacular Rocky Mountain vistas of the San Isabel Forest. A short stint on pavement takes us over Monarch Pass. Near the top, we hit the dirt again over Old Monarch Pass enjoying winding dirt roads, aspen trees and open vistas passing Wuanita Hot Springs on our way to Los Pinos Pass. Los Pinos Pass to Slumgullion Gulch and down into Lake City is a favorite ride. Scenic, easy, and fun riding through the picturesque countryside on county dirt roads. There is a short section of more challenging double track that will be offered as an option. The riding is mostly easy dirt roads. 80% dirt and 20% pavement. FRIDAY Section 2 BDR: Two routes will be offered. 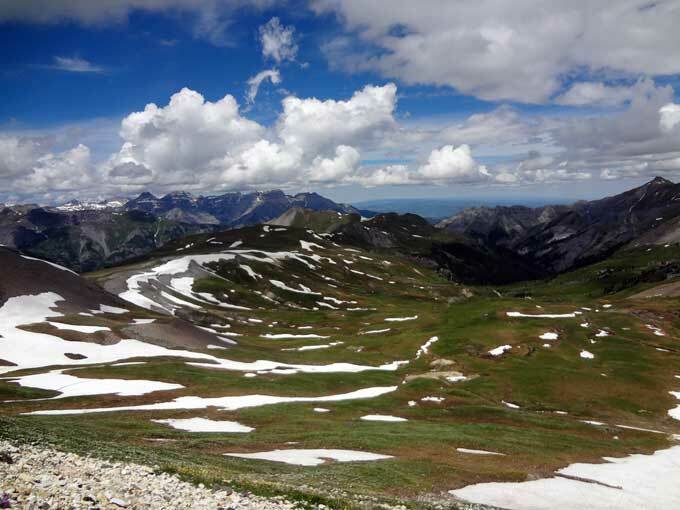 Riders must use strong technical skills for rocks, steep ascents, and descents, tight hairpin turns, elevation and exposure in order to ride Cinnamon Pass up to California Gulch, down Corkscrew Pass (which comes by this name honestly) to Ironton and over Ophir Pass into Telluride. This is the most challenging day of the BDR, with the incomparable scenery. Riders must have strong Intermediate to advanced skills and a high degree of fitness for this choice. 95% dirt 5% pavement. For riders not quite up to this formidable challenge, our alternate route is considerably easier riding sage brush lined Blue Mesa Cutoff and over the dramatic ridge lines and forests of Owl Pass. Picturesque ranch lands and rolling hills complete the ride down Last Dollar Road into Telluride. 50% dirt 50% pavement. SATURDAY Section 1 BDR: The tough riding is now over. We’ll enjoy scenic county dirt roads through immense Aspen Forests, along with countless streams, shimmering lakes, through dense Scrub Oak and Pine Forests. We complete the ride from Telluride to Cortez, Colorado near the “Four Corners” area. Riders will rejoice at our celebratory dinner. Stories will be shared of challenges overcome, fun had along the way, comradery, and splendor. Congratulations all around. This is quite an accomplishment! SUNDAY Farewell: They say “all good things must come to an end.” New lifelong friends will hug and bid each other farewell as riders each head to their next destination.